New York (CNN) -- A New York high school student has made it to the Elite Eight in a different sort of March Madness. Kwasi Enin of Shirley has been accepted by the eight Ivy League schools -- Harvard, Yale, Brown, Columbia, University of Pennsylvania, Dartmouth, Princeton and Cornell -- and then some. He will have his choice as the decision deadline of May 1 approaches. "I applied knowing that going to any of the Ivy League schools would be wonderful," Enin told CNN. "I thought if I applied to all eight, I figured I'd get into one ... but from the first one onwards I said, 'This can't be happening!' I was shocked seeing all these acceptances under my name." Enin scored 2250 out of a possible 2400 on his SAT, placing him in the 98th percentile across the country, according to The College Board. He's also ranked 11th in his class at William Floyd High School, a public school on Long Island, according to his principal, Barbara Butler. Butler said Enin is not only a model academic student but also plays three instruments for the chamber orchestra, sings in an a cappella group, throws shot put and discus for the high school's track and field team, participates in student government and has had a lead role in school plays since the ninth grade. "Usually kids are good athletes or good musicians or good actors, but they don't have all three and then on top add student government. It's a balancing act. He somehow finds time to do it all and then volunteer at a local hospital," Butler said. Butler has been Enin's principal for six years in both middle and high school. "He is an incredibly modest, humble and respectable person," Butler said. "He is incredibly dedicated and he has his priorities straight. He takes advantage of whatever opportunity he is afforded." Rachel Rubin, the founder of Spark Admissions in Massachusetts, who also previously served on admissions committees at selective universities, said the feat is extremely rare. "It's quite atypical," Rubin said, adding that most students do not apply to all the Ivy League schools. "Standardized test scores and good grades will get a student in the door to have their application read," Rubin said. "But it's their extracurricular activities, leadership experience, exceptional talents, recommendation letters and personal essays that will move a student from a pile of 'maybes' to a pile of 'accepted.'" Harvard's acceptance rate, among the most selective in the country, was just 5.9% for the applicants for the class of 2017, according to its admissions site. Enin was also accepted to Duke University and three State University of New York campuses. Don't miss out on the conversation! Follow us on Twitter @CNNschools or on CNN Living on Facebook for the latest stories and to share your perspective. Although Enin has yet to make a decision, there seems to be a front-runner. "I'm thinking about Yale. I really liked their sense of family, relationships between undergraduates and professors, and the residential college. They also have a strong biomedical engineering program, which is a wonderful combination of biology and creative tools that doctors and health care professionals can use." Enin added that Yale also has a strong music program, one of his beloved hobbies that he hopes to continue when he isn't hitting the books in college. He hopes to one day pursue medicine, a dream of his that just so happens to align with his parents' careers. His parents, who immigrated from Ghana in the late 1980s, are both nurses and pushed Enin to receive the highest grades possible and follow his dreams. "Health care is a prominent field that satisfies people beyond finances and edifies people and is about moral development," he said. His advice for future applicants? "Follow your passions in high school and not just follow suit for what you think can get you into these schools," he said. "Develop your outside interests -- not just academics." Labels: Children That Inspire, Did You Know? If you’ve ever dreamed of starting a fashion business, you want to read this. Seun Olubodun, 32, is the founder Duke & Winston, an apparel brand started in 2009 with a cult-like following. Seun has managed to accomplish what few have in just 6 years, turning a grassroots t-shirt company into a thriving retail business. Seun, an experienced entrepreneur, wasn’t feeling challenged by his job anymore and went search of new opportunities. Seun began vending at events all around Philadelphia. His first table at a festival sold 40 of the 50 t-shirts he made. He typically paid $50 a table and made $600 to $2,000 per event. He used the money he earned to buy more inventory. The $5,000 quickly ran out and when he couldn’t pay rent anymore his roommates let him move into the basement on the couch next to the washer and dryer. That didn’t stop Seun; he kept going. Eventually he earned enough to by a van and put the Duke& Winston logo on it. He drove it all around the city and created buzz. “I knew I didn’t have a lot behind me so I wanted to make sure my presentation was above and beyond,” says Seun. It wasn’t long before he landed his first retail account from Matthew Izzo, a local men’s shop, and Urban Outfitters followed with an order for 300 t-shirts that jump-started the business. But Seun never turned away from his grassroots marketing strategies and averages 100 events during the summer months. Two years into the business, he moved into a bi-level ground floor apartment and turned the downstairs into a showroom that looked like a Ralph Lauren store. Seun opened up his living room on the weekends selling 10 to 15 shirts daily from foot traffic on the block. Duke & Winston made its first $100,000 in business from web sales and Seun’s apartment. When the city found out he was selling without a storefront retail license, they told him to shut down the showroom. Seun’s landlord thought he was innovative, so he jumped in and helped to renew the commercial license that was previously on the property. The Duke & Winston brand has continued to grow and just opened their first flagship store in downtown Philadelphia. Stand Out of the Crowd. Create a top-notch brand so that the company looks bigger than what it is. Be honest with yourself and don’t buy into your own hype. Duke & Winston works with a graphic designer from Tommy Hilfiger which gives his t-shirt designs a high-end look. Know Your Market. Focus on the product you’re selling and make sure there’s an existing market for it. “I create my products for real people,” says Seun. “If I see ten guys wearing something, it inspires an idea for Duke & Winston.” Make sure that you know your product and what competitors are offering. Focus on Selling. A lot of fashion businesses get caught up in the smoke and mirrors of the industry. Don’t spend a lot of money putting on fashion shows. Focus on the activities that will directly drive sales. Seun Olubodun’s story shows us that people can make it in the fashion industry if they focus more on building a company that has the opportunity to grow and less on the fashion. Jamila Payne is CEO of Soul Purpose Co. (SPC), and provides email newsletter, online courses and live events for women committed to building profitable and sustainable enterprises while solving some of the world’s toughest problems. She has held posts including director of African Leadership Academy’s Center for Entrepreneurial Leadership, which was established through a $1.6 million multi-year partnership with The MasterCard Foundation. She is also author of several books including Your Big Year (2013) From Payne to Power. She has been a speaker at events including Jamila has been a speaker at The National Urban League Conference, Black Enterprise Entrepreneurship Conference, and the African Leadership Network and is host of WKDU 91.7 FM’s Heart & Hustle. INDIANAPOLIS - A Broad Ripple High School student is one of only 1,000 students in the country to receive the prestigious Gates Millennium Scholarship. The scholarship -- funded by the Bill and Melinda Gates Foundation -- covers a full ride to any college or university in the country, all the way through a doctoral degree if the recipient chooses. At 16, Alex Dunlap is poised to graduate Broad Ripple Magnet High School a year early in May. She knew all her hard work had paid off when she got the letter announcing her scholarship. "Oh, I was ecstatic," she said. "I started crying, my mom started crying." Dunlap plans to pursue her passion for languages. "I'm going to study Spanish, French and Chinese in college with a focus in Arabic, I'm going to pick that one up as well," she said. "And after undergrad, I plan on attending law school." Dunlap hopes to fight for the rights of children in foreign countries, but while her travels might take her worldwide, she plans to stay close to home for college. "I've just recently decided to go to DePauw because they have such a great liberal arts program," she said. "Their study abroad program is great and exactly what I need because of my languages. Their language program is great. And I'm going to be entering as a Bonner scholar, which is a community service scholarship." Beyond being a great student, Dunlap has a passion for community service. She teaches Spanish to inner-city kids, and she plans to keep volunteering. She has this advice to other students. "Always work hard, study hard and make sure you find something you're passionate about in high school," she said. "For me it was languages and it was music. And I was passionate and I loved doing it, so I always worked hard doing it." 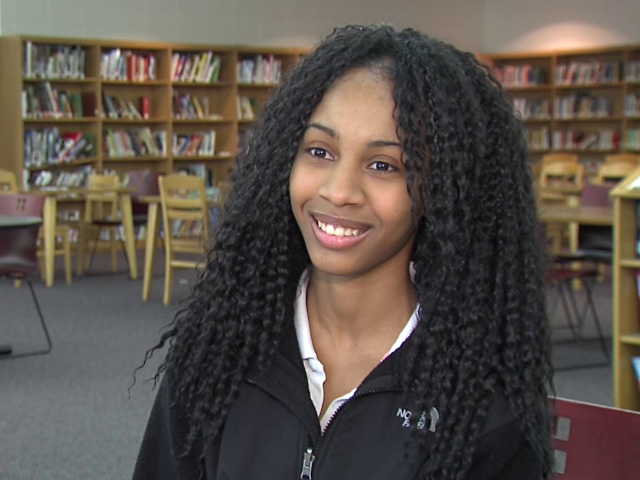 Dunlap is the first student ever from Broad Ripple High School to become a Gates Scholar. She'll meet the other 999 winners when Bill Gates flies them all out to meet each other and network.